After traveling more than 3,600 miles above Earth and 600 miles over sea, NASA’s Orion spacecraft completed the final leg of its journey by land Thursday, arriving home at the agency’s Kennedy Space Center in Florida. Media representatives are invited to attend an event at 10:30 a.m. EST Friday, Dec. 19, marking the arrival. U.S. media must apply for credentials to attend Friday’s event at Kennedy by 8 a.m. Friday. All media must present two forms of legal, government identification to access Kennedy. One form must be a photo ID, such as a passport or driver's license. Media not previously credentialed for SpaceX CRS-5 will be issued badges at the Kennedy Badging Office, located on State Road 405 east of the Kennedy Space Center Visitor Complex. Journalists must arrive at Kennedy's Press Site by 9:45 a.m. Friday for transportation to the event. The deadline for international media to attend in person already has passed. The spacecraft’s cross-country return, a 2,700 mile road trip from Naval Base San Diego to Kennedy, sets the stage for in-depth analysis of data obtained during Orion’s trip to space and will provide engineers detailed information on how the spacecraft fared during its two-orbit, 4.5-hour flight test, completed on Dec. 5. While the information is being gathered from the flight test, testing also will continue on Earth. On Dec. 18, engineers dropped a test version of the Orion capsule from a C-17 aircraft 25,000 feet above U.S. Army’s Yuma Proving Ground in Arizona. The latest in a series of tests designed to certify Orion’s parachute system, the test simulated a failure of one of Orion’s three main parachutes for a first-time demonstration of several modifications made to the parachute system to improve its performance. 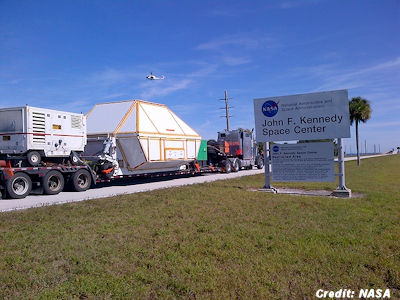 NASA’s Ground Systems Development and Operations Program managed Orion’s cross-country trip from Naval Base San Diego to Kennedy. The crew module will be refurbished for use in Ascent Abort-2 in 2018, a test of Orion’s launch abort system. . . .